138 customers have given this product a 5-star rating. My word, it looks huge! It's funny how you can read dimensions on a website or in a catalogue - full, complete and accurate dimensions, and yet still be surprised by the size of something when it arrives. However I think I was right to get this one, because the Stairville SB-140 wouldn't have been quite big enough for one of my lights. Like the smaller Stairville SB-140, the padding on this bag is a bit thinner than I would ideally like. It will offer more protection than a holdall from the high street, but I would prefer even more protection for my equipment than is offered by default. Having said that, I was imagining making foam inserts to go inside them anyway, so it doesn't really matter I suppose. 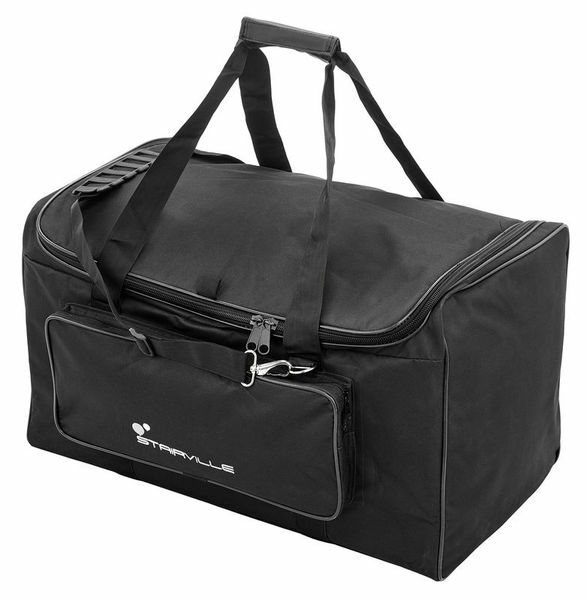 Unlike the Stairville SB-140 this bag does NOT have handles on the ends. That's a shame, because a bigger bag might be heavier and need to be carried between two people. Having said that, the bag might be long enough to fold up if you tried if the contents were flexible, so maybe that is why. Note that the webbing straps that form the handles are a bit thinner than you might be expecting. I don't think there is a risk of them breaking, but they don't stand up under their own weight which would be a handy feature if you have to put the bag down to open a door or the car boot.